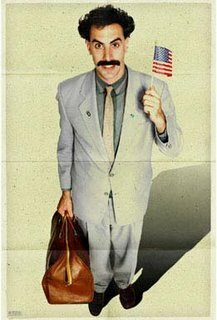 Excitement over the release of Borat: Cultural Learnings of America for Make Benefit Glorious Nation of Kazakhstan is reaching a fever pitch. Early reports coming out from previews are calling it one of the funniest movies ever made. Yes, ever. Sacha Baron Cohen's clueless Kazakh journalist is taking the world by storm, never being seen in public out of character and even garnering the (admittedly negative) notice of the government and president of Kazakhstan itself, resulting in unintentionally hilarious "damage control" ads in the New York Times. There is even buzz for Cohen as a possible Best Actor candidate. As impossible as that may sound, if the movie is as good as it's supposed to be, and his performance (which is mostly improvised) is as fearless as it looks, he may deserve one. But has all this hype too much? Can it ever live up to the astronomical expectations? We'll find out when the film is released this Friday. Wouldn't it be something to see Cohen arrive at the ceremony in character as Borat? That would would skewer the night's stuffiness like a hot iron on an ice cube.